To compliment use with the GT Supercharger kit, torque capacity is rated at 400Nm (41Kgm / 295lbft) which approximates to 295kw (400ps). This superior capacity for a single plate clutch allows full use of 86/BRZ with high power levels. As well as torque capacity, light weight and ease of operation where also balanced making fitment to NA vehicles feel natural with increased response which facilitates quick shifting. "Billet Oil Filler Cap" for engine compartment dress-up in a simple way. This HKS Billet Oil Filler Cap is made of aluminum alloy (Duralumin) with red Alumite treatment. Improves oil pressure drop and flow properties by approximately 30%. Large diameter of "Super Intake Hole" and newly developed low resistance hybrid filter allow low pressure loss. Dry boiling point at 282℃, wet boiling point at 184℃. Viscosity characteristics can be exerted when used in cold climates because of its high performance at low temperature even with its high boiling point. Boiling point of F-706 is higher than common brake oil for street use; therefore, the kinetic viscosity at high temperature is relatively high which is suitable for circuit use. Ignitionability, durability, anti-insulation all reinforced. 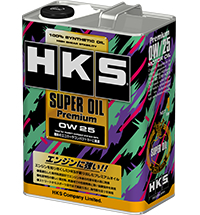 HKS has made the best plug for both tuning engine and normal engine. 100% synthetic special blend oil. The unique viscosity categorization will effect at molecular level on boundary lubrication. Best to use for normal cars or exhaust tuned cars, which specified oil viscosity from 0w20 range fuel efficiency to 0w30 range.